We conduct programmes and competitions from time to time. Why don't you sign up for information on our upcoming events? Shruthilaya Composers day was celebrated for Two days Februrary 3rd 2019 at Shirdi Sai Temple hall with renditions of Saint Tyagaraja's Pancharatna kritis and March 23rd 2019 at Chimmaya Niketan with Annual event. 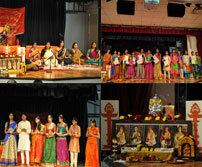 "A day in the life of Saint Tyagaraja" The Vocal support was by Shruthilaya Students & Teachers. Shruthilaya conducted a Bhajan & Devotional songs event as part of Navarathri celebrations on 12th November 2017 at Shiridi Sai Temple. Shruthilaya Composers day event was held on March 4th 2017 at Hindu Temple of Atlanta followed by a Competition for Varnam & Kriti level children. Eminent Musicians Sri Salem Shriram, Sri Prashanth Krishnamoorthy & Sri Suresh Kothandaraman were invited to judge the Competition.